← Suspended in Dusk is out! These beautiful things arrived today from Swan River Press. 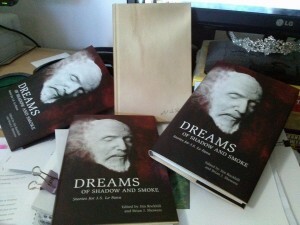 Dreams of Shadow and Smoke is a tribute anthology for J. S. Le Fanu, he of Carmilla and Uncle Silas fame (among many, many others). And it contains my story “Let the Words Take You”, a riff on “The Child that Went With the Fairies”. This entry was posted in News and tagged angela slatter, Brian J Shwoers, Derek John, Emma Darwin, Gavin Selerie, James Rockhill, JS Le Fanu, lynda e rucker, Mark Valentine, Martin Hayes, Sarah LeFanu, Swan River Press. Bookmark the permalink.